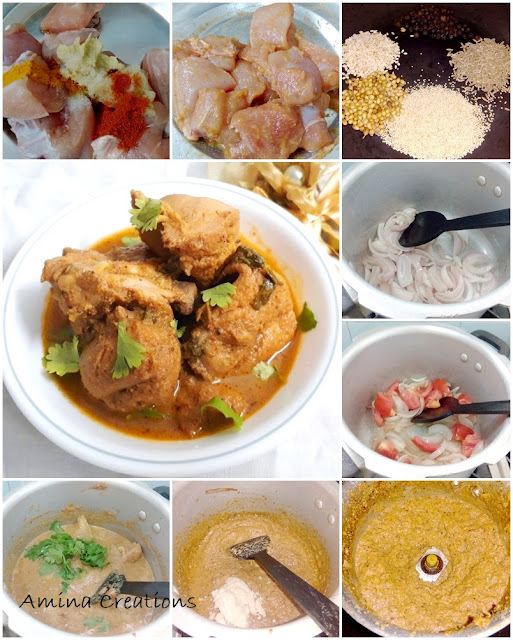 Kolhapuri chicken curry is a delicious and popular chicken curry. The main ingredients that enhance the taste and flavour of this curry are poppy seeds, coconut and spices. 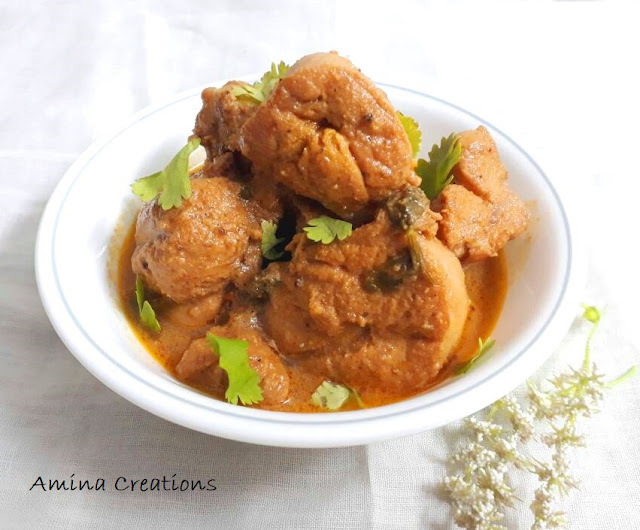 Do try out this easy kolhapuri chicken curry in a pressure cooker recipe and serve hot with plain cooked rice or chapathi. Take all the ingredients of the marinade in a bowl and mix well. Close a lid and set aside for atleast half an hour. Now take a non stick pan and all the ingredients given under the heading “to roast” and roast in a low flame for a few seconds till you get a nice aroma. Allow this to cool down and transfer to a mixer jar. Heat oil in a pressure cooker and add the sliced onions. Saute till the onions turn golden in colour. Next add tomatoes and cook for a few minutes till the onions turn soft and mushy and oil starts separating. Switch off the gas and allow it to cool down. Now transfer the cooked onions and tomatoes to the same mixer jar and grind everything to a fine paste. Heat 2 tbsp oil in the same cooker and add the ground paste to it. Cook in a low flame for a couple of minutes and then add coconut paste and garam masala powder. Add the marinated chicken along with the marinade, salt to taste, coriander leaves and about 1 cup water. Close a lid and pressure cook for 2 to 3 whistles. Allow the steam to release and open the lid. Serve hot with plain rice or chapathi.